In “Mind-blowing gravitation” there are many links to the internet with additional information. In the e-book these links are clickable. If you obtained the printed version, this overview of used links could be handy for you if you want to follow these links. So just because of our familiarity with this strength, we take the risk to stand on it by not even knowing on what force we stand. As a result, our consciousness seems to become gradually more flexible in accepting the facts, that reduce our favored central position in the universe increasingly. On http://www.human-DNA.org , you will find a list of theories that try to explain what kind of force GRAVITATION is. The present-day value of H (i.e., H0) counts between 50 to 100 km/sec/Mega parsecs (a parsec is 3.26 l.y). The quasars (K’) seem to move away from us rapidly. That’s why the analogy of “baking raisin bread” is thought to be more appropriate. These concepts can be found in nearly every book in which the expansion of the universe is explained. This idea is the key for this expansion theory: our brain is part of the expansion, although not everybody has the same interpretation. In par. 2.2. we will change our position to another reference system and look at our own solar system (Milky Way) as K’. It only depends on which reference system we accept as our main point of perception. This acceleration causes expansion of mass/energy in galaxies, stars, planets, molecules, atoms and electrons. The energy is partially converted in energy needed for circular movements (kinetic energy, angular momentum) and partially in heat, radiation and increasing matter, although not everybody has the same interpretation. Jupiter orbits the sun with 13 km per sec. Keep in mind that our planets are “following” our sun in her orbit through our galaxy. Not only the planets with their moons are following the sun, but the Kuiperbelt and Oortcloud are “following” too. Imagine! ALL MATTER EXPANDSThe universe expands equally like a dot on a balloon, suggesting that space is becoming larger as long as the balloon is still blown bigger. suppose that we are a part of that surface, then we see nothing changing, nothing getting bigger, no expansion. our recording equipment, our measuring rod, our eye capacity expands equally and there is nothing happening. Could this really be true? We start to search for some facts that must prove that this cannot be true. If at first the idea is not absurd, then there is no hope for it. Albert Einstein. The acceleration to the ground is equal for all objects the large golden ball is falling just as quick as the football. The expansion does not decrease with the distance “R” squared (as the third law of Newton indicates), but with 4 pi r2 because the impact of the expansion is divided over the surface of the ball-mass with radius r.
See David Levitt “How gravity works”. We still stand firmly in our shoes whatever moves we make. Literally: expansion blows our minds. Looking from our time and place, it really looks like an enormous explosion. This is the dark matter that is discovered lately. In the first quarter of the nineteenth century, scientists discovered that light-waves move on through an “empty” space. Thus one felt obliged to introduce a field which could also exist in the absence of matter in empty space and it was called ETHER. 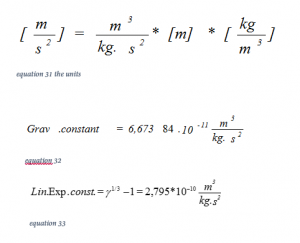 The Observational Impetus For Le Sage Gravity – Halton Arp’s official website My own working hypothesis for gravity is now that gravitons are very low mass particles with a huge De Broglie wavelength compared to photons. Now we think that our universe consists of 25% of dark matter and 68% of dark energy in the present day observable universe. The fourth of July 2012 Scientists around the world celebrated the detection of what appears to be the Higgs boson, an elusive subatomic particle whose existence is a major step in understanding the origins of the universe. The Higgs field is the theoretical field of energy that permeates the universe, according to the theory put forth in 1964 by Scottish theoretical physicist Peter Higgs.
. This expanding field could be the same field, hat we call Higgs field, dark matter, Weakly interacting massive particles (WIMPs), and Strongly Interacting Massive Particles (SIMPs). All are a theoretical form of particles. Matter is expanding by travelling through the Higgs field. This speed v = 12278 m/s (12,278 km per second) is probably the speed that our part of the universe is travelling through space. That means it is the velocity of our observable universe circling around the center of the universe or the velocity related to a universal inertial (background)system or a primary reference frame. Halton Arp: An unexpected property of astronomical objects (and therefore an ignored and suppressed subject) is that their properties are quantized. I think it is interesting to read what Halton Arp wrote in his essay The observational impetus for le Sage gravity. As Dr. Arp’s colleagues lost patience with his quest, he was no longer invited to speak at major conferences, and his observing time on the mighty 200-inch telescope began to dry up. And even if this expansion theory is not correct, I hope you found many interesting equations, ideas and videos that give you more insight in gravitation. But if this expansion theory is not correct: then the question remains: what is gravitation? You also can find essays that oppose the expansion theory Gravity as Expansion and Many Worlds Interesting to read and compare. Abolish a Force – Describes qualitatively how gravity can be accounted for by nuclear forces. American Antigravity – Commercial Antigravity research and products. Site contains videos, graphics, plans and schematics. Antigravity.org – Sergey Ivanenko explains gravity as an inertial phenomenon caused by movement of the universe with respect to higher dimensions. Galactic Gravitation Calculator – Demonstrates how new quantum gravity theory explains orbits in spiral galaxies without Dark Matter. Gravitational Force Vectoring – A site describing how gravity can be created in the context of the conservation of energy and quantum mechanics, with information on related events. Gravity Made Simple – An unusual description of how gravity may work based on time and motion and the superstring theory where all things are vibrations. Gravity Research by Morton F. Spears – Provides downloadable reports on a new approach to understanding gravity based on electrostatic relationships and the permittivity of open space. The Gravnetic Field – The existence of a vector field is shown, originated by all moving masses which exerts a force on all other nearby moving masses. Lorentz-Poincare relativity and a scalar theory of gravitation – Special relativity may be derived from Lorentz contraction. It follows that the relativity principle could be broken in the presence of gravitation. This seems to work. For many years I never questioned the obvious fact that masses attracted each other (inversely as the square of their separation – to complete the mantra). The attraction was so blatant that it required no thought. But then observations of galaxies and quasars forced me to accept the fact that extragalactic redshifts were primarily intrinsic and not the result of recessional velocity in an expanding universe. http://www.nytimes.com/2014/01/07/science/space/halton-c-arp-astronomer-who-challenged-big-bang-theory-dies-at-86.html?_r=0 Halton C. Arp, a provocative son of American astronomy whose dogged insistence that astronomers had misread the distances to quasars cast doubt on the Big Bang theory of the universe and led to his exile from his peers and the telescopes he loved, died on Dec. 28 in Munich. http://electric-cosmos.org/arp.htm Halton C. Arp is a professional astronomer who, earlier in his career, was Edwin Hubble’s assistant. He has earned the Helen B.Warner prize, the Newcomb Cleveland award and the Alexander von Humboldt Senior Scientist Award. For years he worked at the Mt. Palomar and Mt. Wilson observatories. While there, he developed his well known catalog of “Peculiar Galaxies” that are misshapen or irregular in appearance. Thus, we come to the idea that not only is the universe expanding with all the associated stellar systems, but so is all matter—including the atoms and all particles which built matter. Halton Arp: Now that we reference the primary reference frame we are reminded that this is yet another strike against the hallowed relativity theory which is supposed to have no primary reference frame. This website aims to put theories about gravitation and expansion together in an overview. APPENDIX 1: some remarks about Hubble constant. The recession speed V (velocity) is H * R on the edge of the visible universe. The quantum physics, however, provided more and more mathematical calculations and less and less concrete pictures. APPENDIX 2: some remarks about other units. To describe the expansion at the atomic level, we have to make a conversion of the following units: Volt, joule, Ampère, Coulomb, Newton, Farad, Tesla and Weber. That way we can recognize the MKS units”cubic meter,” which is so important to describing expansion. Who wants to do some counting? I have a lot of these mind boggling unit calculations. APPENDIX 3: derivation of velocity 12278 m/s. 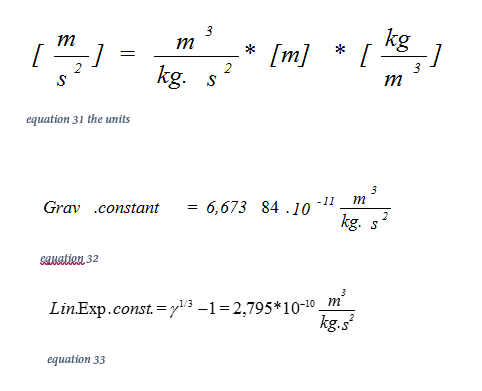 In the printed version there are two equations that are printed over eachother: equation 31 and 33. Gravity (and magnetic forces) cannot be boiled down into anything else, because they are what everything boils down to. They are the primitives of physics, held up by human made crutches. They’re just as numbers are to mathematics. If we could deconstruct gravity into further primitives, it would be no short of groundbreaking. However, we would still be left with new primitives. We cannot overcome what’s at the bottom.